Welcome to my personal library of music and classic video games. This collection is focused on my adolescent experience, therefore it goes deep on specific arguments such as the legendary Atari 2600, Sinclair ZX Spectrum, original Arcade Games, Nintendo’s Game & Watch handhelds and last, but not least, a bunch of music, including many rarities and a special dedication to The Cure, my favourite band of all times. Beyond a mere archival purpose, my attempt is to keep the flame of memory alive. Enjoy your visit! Disclaimer – The administrator won’t distribute any copyrighted material without authors permissions. 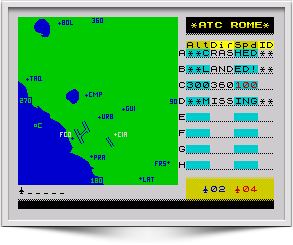 ATC (Air Traffic Control) Rome is a basic program able to assign and manage values to multiple elements on the screen. The program includes a graphic map of the Lazio region in Italy which displays some districts beacons and two landing fields. Thanks to a special graphic compression for the map provided by Einar Saukas, the program has been revisited to fit in 16K memory. It was a real challenge and the achievement isn’t taken for granted at all, also considering that some modern homebrew releases often overflow from 48K to 128K. 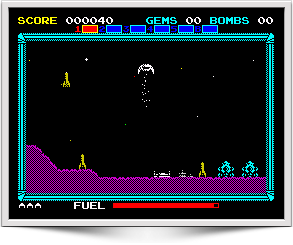 A first release of this game was written in Basic in far 1989, entitled Space Chase. 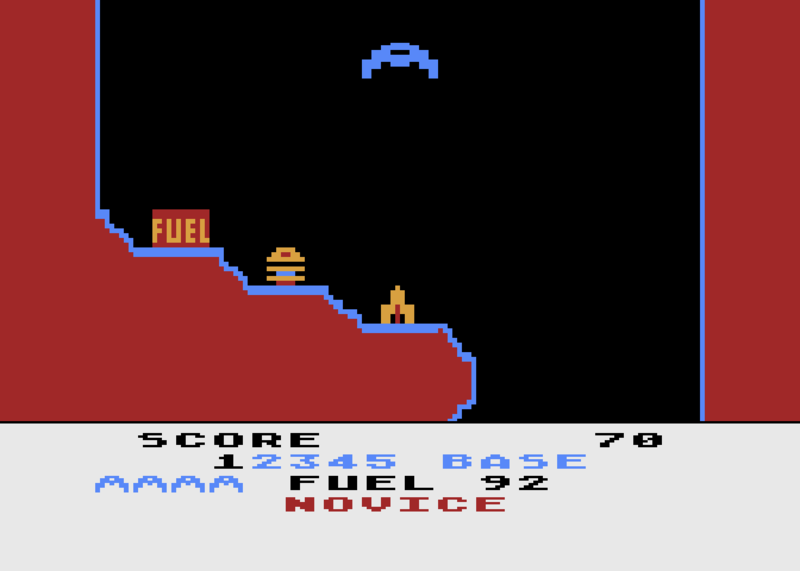 It was an attempt to program a vertical version of Scramble, which is still author’s favourite arcade game, and essentially inspired by Caverns of Mars for the Atari 800/XL/XE computers. 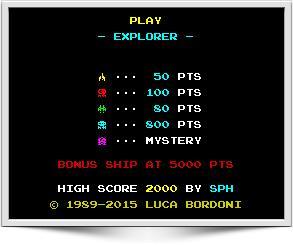 The title was taken from the popular italian clone of the original Scramble arcade game. In 2015 the code was totally rewritten and compiled with Boriel’s ZX Basic, revisiting the graphics and bringing a longer professional look. Three years later, a physical cassette release was published by George Cropper‘s Bumfun Gaming. A tribute to the mystical Mire Mare by Ultimate Play The Game, the unreleased last chapter of the Sabreman‘s saga. This modest homebrew adventure doesn’t demand to compete with any of the official Sabreman titles, even if it took full advantage of the Arcade Game Designer capabilities. 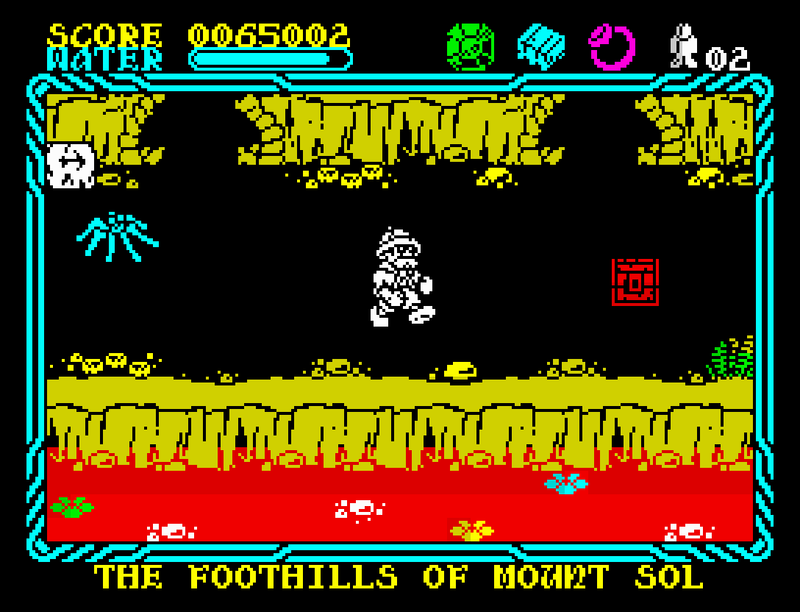 The inspiration for this game was originally seeded by Jarrod Bentley‘s graphic mockups previously released for a Retro Gamer article about Mire Mare. Land of Mire Mare was reviewed by the Retro Gamer magazine, March 2014, issue #127 / page 104, scoring 85%. The game was NOT made for profit purposes, as speculated in some bad reviews around the web. As a matter of fact, it has always been available for free at the official AGD Forum. However, a limited edition of the game has been published on physical cassettes as rewards for The Story of the ZX Spectrum in Pixels book by Chris Wilkins. Consequently, some rightful owners posted eBay auctions to sell their copy, but neither the author, nor the contributors, haven’t ever gained a single coin from this homebrew work. 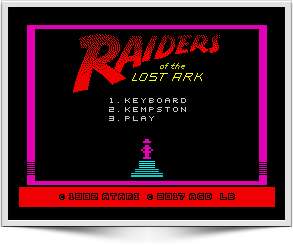 Since Raiders of the Lost Ark represents one of my favourite movies of all times, I couldn’t resist! 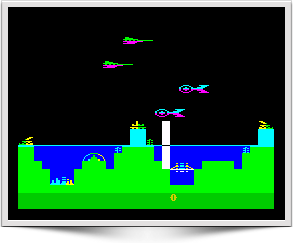 Here’s the only (unofficial) port of the classic Atari 2600 adventure from far 1982, preserving the original “abstract” style and graphics. From the inlay card: “You are Indiana Jones, your mission is to find the Ark of the Covenant. To find the Ark, you must travel to ancient Egypt and follow clues that leas to the Well of the Souls. Use Indy’s bullwhip and your own wits to get out of danger – and watch out for snakes!”. This adaptation differs from the original 1982 cartridge in few steps; however, the gameplay and the general feeling result incredibly close to the original. 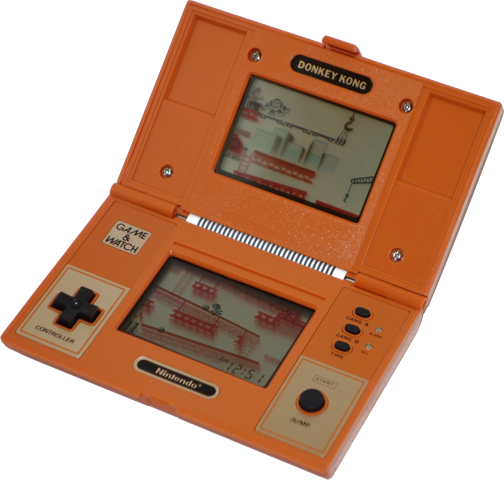 A discussed feature was about the controls: the original game needs both the console joysticks, one to control the player and the other to browse the inventory. In the ZX Spectrum version, controls are simplified: directions, fire (which also works as a select button) and one more key to browse the inventory. A fundamental step is required in both versions (which is an abandoned practice in modern times): read the manual! That’s why detailed instructions along with a solution sheet couldn’t miss. 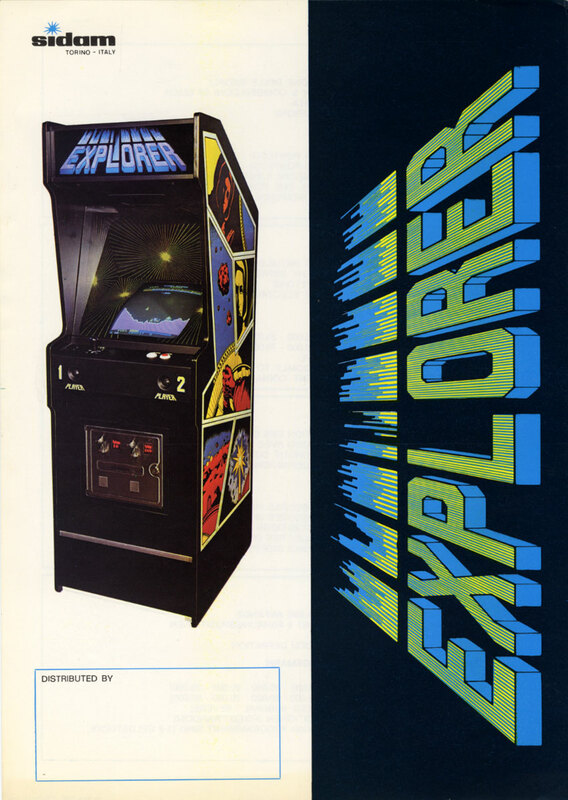 Take a bit of Scramble, Lunar Lander and Thrust and shake well… here’s Explorer 2! The Mars Corporation has reassembled the arsenal and from the ashes of the first battle a new space base has been built. Your task is to find a nuclear bomb and destroy the reactor down in the deeps of the enemy outposts dropping the devastating weapon over it. Pay attention to the fuel level, land over the docks for a safe supply and fire the fuel tanks. Along the way you could find preciuos minerals which will let you gain bonus points. 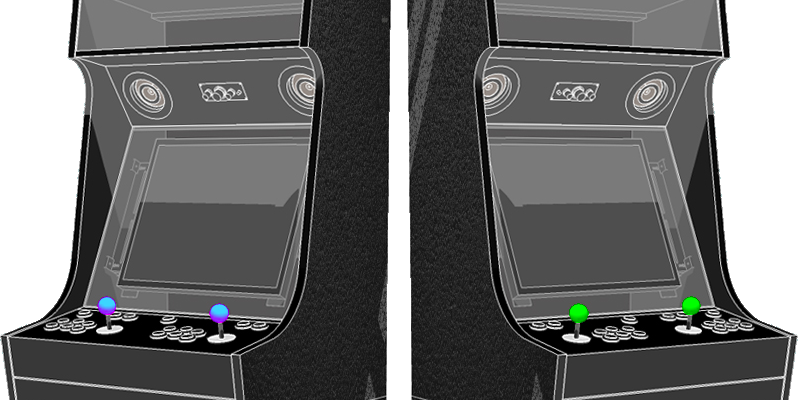 Your spaceship will automatically climb down, balance the position to move amongst the narrowest passages. Walls are deadly, however, there’re few seconds of tolerance before the collision. There’s more than a bomb around the labyrinth; once found the first one, keep it aside for the final reactor. This is probably the first attempt to port on the ZX Spectrum the brilliant Yars’ Revenge from the Atari 2600 console. This AGD release was the second after Land of Mire Mare by the homebrew author Luca Bordoni, it was originally entitled Yars’ Revenge ZX, then changed in order to avoid possible copyrights infringements. Andrew Owen proposed the new title. Since an attempt to include an AY tune in background, the development of this new version was temporarily suspended. In 2018 the project rised again thanks to Allan Turvery, who included in AGDX an assembly code to let a single-block dig. Previously, if the dig position was between two character blocks, the code generated an inaccurate dig, deleting multiple blocks. Then, in occasion of the Monument Microgames physical release, Jarrod Bentley added an awesome loading screen based on the Yars’ Revenge original cover. Blast Gorgon vessels before they come close enough to demolish Atlantis with the deathray. Game ends when all seven of Atlantis’ installations have been levelled and none is left in reserve. To reach the King’s treasures, the Prince runs across the bridge. He must dodge fireballs tossed by Dragon hatchlings. He nimbly ducks under the high ones and leaps over the low ones. Fortunately, the fireballs can’t hurt the Prince if he runs back into the tower at the right end of the bridge. When the Prince reaches the left side of the bridge, he arrives in the storeroom. He’s inside a hiding place he can return to any time. The storeroom is filled with beautiful objects – and a fierce Dragon whose very breath can cost the Prince one of his five precious chances! When the Dragon looks the other way, the Prince runs to each object and retrieves it for the King. And when he has bravely cleared out the room of its treasures, a way of escape appears. He runs to it and reappears on the bridge, ready for another daring raid. Help the Prince get as many treasures as possible, before he’s hit by fireballs… and remember, every Dragon you meet is harder to beat! Shoot the toxic alien sludge blocks before they reach the ground! This is the only conversion of an absolutely brilliant & rare Atari 2600 homebrew cartridge entitled Alien Ooze. 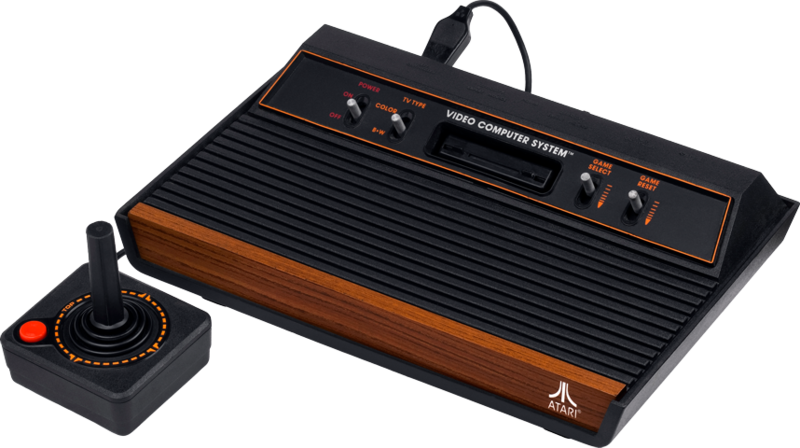 The original release, as simple as addictive, was reported by George Cropper on the AtariAge website. 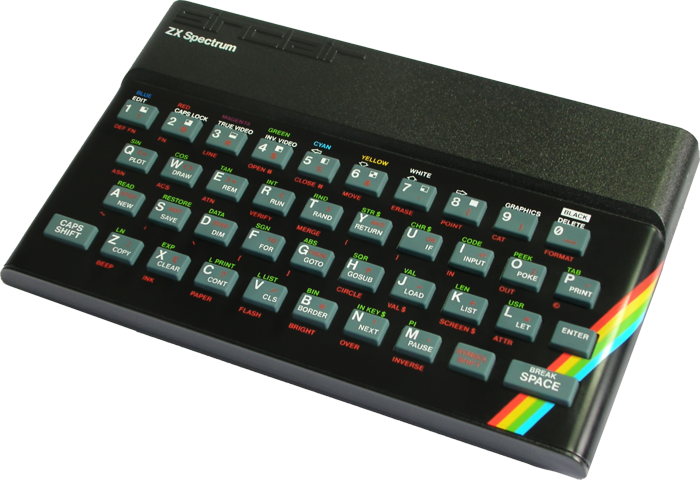 George asked for a ZX Spectrum conversion and here is it! 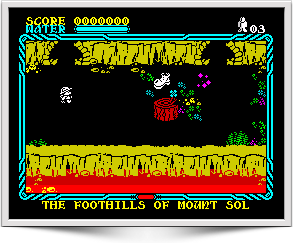 The game fits in a 16K ZX Spectrum, representing a rare gem in modern times.